Torsades de pointes or torsade de pointes (TdP or simply torsade(s)) (French: [tɔʁsad də pwɛ̃t], translated as "twisting of the points"), is a specific type of abnormal heart rhythm that can lead to sudden cardiac death. It is a polymorphic ventricular tachycardia that exhibits distinct characteristics on the electrocardiogram (ECG). It was described by Dessertenne in 1966. Prolongation of the QT interval can increase a person's risk of developing this abnormal heart rhythm. Most episodes revert spontaneously to a normal sinus rhythm. Other possible outcomes include palpitations, dizziness, lightheadedness (short episodes), fainting (longer episodes), and sudden cardiac death. Common causes for torsades de pointes include diarrhea, low blood magnesium, and low blood potassium. It is commonly seen in malnourished individuals and chronic alcoholics since they are often deficient in potassium and/or magnesium. Certain combinations of drugs resulting in drug interactions can contribute to torsades de pointes risk. QT prolonging medications such as clarithromycin, levofloxacin, or haloperidol, when taken at the same time as a specific cytochrome P450 inhibitor such as fluoxetine, cimetidine or foods like grapefruit, can result in higher than normal levels of QT prolonging medications in the bloodstream and increase a person's risk of developing torsades de pointes. In addition, inherited long QT syndrome significantly increases the risk of episodes of torsades de pointes. TdP as a prescription drug side effect has been a major liability and reason for withdrawal of medications from the marketplace. Examples of compounds linked to clinical observations of TdP include amiodarone, fluoroquinolones, methadone, lithium, chloroquine, erythromycin, amphetamine, ephedrine, pseudoephedrine, methylphenidate, and phenothiazines. It can also be the side effect of some antiarrhythmic medications such as sotalol, procainamide, and quinidine. The gastrokinetic drug cisapride (Propulsid) was withdrawn from the US market in 2000 after such interactions led to deaths caused by long QT syndrome-induced torsades de pointes. In many cases this effect can be directly linked to QT prolongation mediated predominant by inhibition of the hERG channel. In September 2011 (subsequently updated in March 2012 and February 2013), the FDA issued a warning concerning increased incidence of QT elongation with doses of the antidepressant Celexa (citalopram) above 40 mg per day, which is considered the maximum allowable dosage, increasing the risk of Torsades. However, the study, "Evaluation of the FDA Warning Against Prescribing Citalopram at Doses Exceeding 40 mg" reported no increased risk of abnormal arrhythmias thus questioning the merit of the FDA warning. 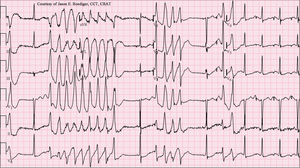 The ECG tracing in torsades demonstrates a polymorphic ventricular tachycardia with a characteristic illusion of a twisting of the QRS complex around the isoelectric baseline (peaks which are at first pointing up are seen to be pointing down for subsequent "beats" when looking at ECG traces of the "heartbeat"). It is hemodynamically unstable and causes a sudden drop in arterial blood pressure, leading to dizziness and fainting. Depending on their cause, most individual episodes of torsades de pointes revert to normal sinus rhythm within a few seconds, but may also persist and possibly degenerate into ventricular fibrillation, which will lead to sudden death in the absence of prompt medical intervention. Torsades de pointes is associated with long QT syndrome, a condition whereby prolonged QT intervals are visible on the ECG. Long QT intervals predispose the patient to an R-on-T phenomenon, where the R wave representing ventricular depolarization occurs during the relative refractory period at the end of repolarization (represented by the latter half of the T-wave). An R-on-T can initiate torsades. Sometimes pathologic T-U waves may be seen in the ECG before the initiation of torsades. A "short-coupled variant of torsade de pointes", which presents without long QT syndrome, was also described in 1994. Treatment is directed at withdrawal of the offending agent, infusion of magnesium sulfate, antiarrhythmic drugs, and electrical therapy such as a temporary pacemaker as needed. Because of the polymorphic nature of torsades de pointes, synchronized cardioversion may not be possible, and the patient may require an unsynchronized shock (or defibrillation). The phenomenon was originally described in a French medical journal by Dessertenne in 1966, when he observed this cardiac rhythm disorder in an 80-year-old female patient with complete intermittent atrioventricular block. In coining the term, he referred his colleagues to the "Dictionnaire Le Robert," a bilingual French English dictionary, of which his wife had just given him a copy. Here "torsade" is defined as (a) a bundle of threads twisted in a helix or spiral, for ornamental purposes, as in an Aran sweater; (b) long hair twisted together, or (c) an ornamental motif as seen on architectural columns. The singular and plural forms (torsade de pointes and torsades de pointes) have both often been used. The question of whether either one is "correct" and the other "incorrect" has repeatedly arisen. Among major medical dictionaries, one enters only the plural form, another enters the plural form as the headword but lists the singular as a variant, and another enters the singular form as the headword and gives a usage comment saying that the plural is not preferred. One group of physicians suggests that it would make sense to use the singular form as the general entity name (whether comprising a single or repeated episodes) and that one might best reserve the plural form for describing repeated twistings during a single episode. Regarding the natural language variation, they conclude good-naturedly, "Wasn't it the French who coined the term 'vive la difference?'" ↑ Labant, MaryAnn (November 15, 2014). "Weaving a Stronger Drug Safety Net". Gen. Eng. Biotechnol. News (paper). 34 (20). p. 1. ↑ "Drugs That Prolong the QT Interval or Induce Torsades de Pointes". Point of Care Quick Reference. American Academy of Pediatrics. March 11, 2010. ↑ "FDA Drug Safety Communication: Revised recommendations for Celexa (citalopram hydrobromide) related to a potential risk of abnormal heart rhythms with high doses" (Press release). USFDA. February 15, 2013. Retrieved December 13, 2014. ↑ Deshmukh, Anand; Ulveling, Kyle; et al. (2012). "Prolonged QTc interval and torsades de pointes induced by citalopram". Tex. Heart Inst. J. 39 (1): 68–70. PMC 3298934 . PMID 22412232. ↑ K Zivin; PN Pfeiffer; ASB Bohnert; D Ganoczy; FC Blow; BK Nallamothu; HC Kales (June 1, 2013). "Evaluation of the FDA Warning Against Prescribing Citalopram at Doses Exceeding 40 mg". Am J Psychiatry. 170 (6): 642–650. doi:10.1176/appi.ajp.2013.12030408. PMID 23640689. ↑ John, J.; Amley, X.; Bombino, G.; Gitelis, C.; Topi, B.; Hollander, G.; Ghosh, J. (2010). "Torsade de Pointes due to Methadone Use in a Patient with HIV and Hepatitis C Coinfection". Cardiology Research and Practice. 2010: 1–4. doi:10.4061/2010/524764. PMC 3021856 . PMID 21253542. ↑ Leenhardt A, Glaser E, Burguera M, Nürnberg M, Maison-Blanche P, Coumel P (January 1994). "Short-coupled variant of torsade de pointes. A new electrocardiographic entity in the spectrum of idiopathic ventricular tachyarrhythmias" (PDF). Circulation. 89 (1): 206–15. doi:10.1161/01.CIR.89.1.206. PMID 8281648. ↑ Hoshino, Kenji; Ogawa Kiyoshi; et al. (October 2004). "Optimal administration dosage of magnesium sulfate for torsades de pointes in children with long QT syndrome". J. Am. Coll. Nutr. 23 (5): 497S–500S. doi:10.1080/07315724.2004.10719388. PMID 15466950. ↑ Hoshino, Kenji; Ogawa, Kiyoshi; et al. (April 2006). "Successful uses of magnesium sulfate for torsades de pointes in children with long QT syndrome". Pediatr. Int. 48 (2): 112–7. doi:10.1111/j.1442-200X.2006.02177.x. PMID 16635167. 1 2 Moise NS (1999), "As Americans, we should get this right [correspondence and response]", Circulation, 100: 1462, doi:10.1161/01.CIR.100.13.1462.